Last Thursday, the Africa Growth Initiative at Brookings released its annual Foresight Africa report, highlighting six key priorities for the African continent in the year 2018. The first chapter of the report, Unleashing Africa’s inner strengths: Institutions, policies and champions, discusses African strategies for tackling the continent’s challenges more effectively. In the chapter, essay author Rwandan President Paul Kagame notes that at independence individual African countries were divided, unable to capitalize on their wealth, and seemed to fall behind the rest of the world. However, Kagame adds that these days are “drawing to a close,” largely attributed to increased regional integration in Africa. Indeed, regional integration has been a priority for many African policymakers in recent years, notably demonstrated by the Continental Free Trade Agreement (see Vera Songwe’s viewpoint on the CFTA in Chapter 1 for more information). Given this priority, how far along are the regional economic communities (RECs) in their integration journeys? Africa is home to a large set of RECs, which differ not only in composition but also in their performance towards integration. 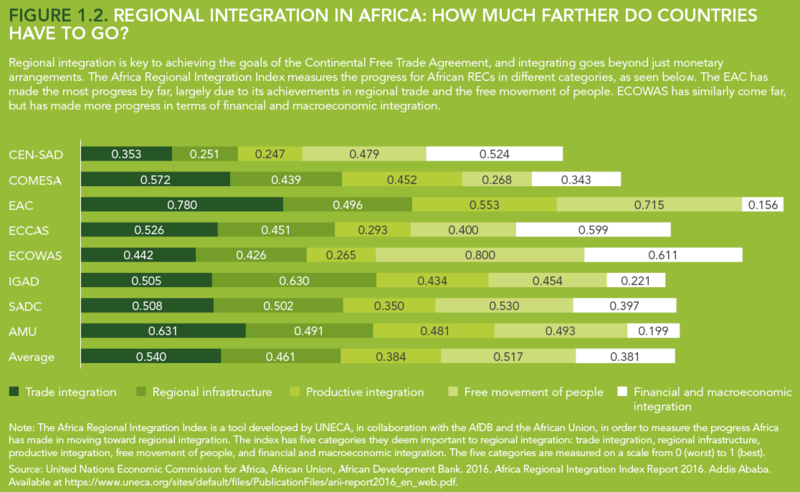 The Africa Regional Integration Index, developed by the United Nations Economic Commission for Africa, the African Development Bank, and the African Union, measures the progress of African RECs in different categories, as seen in Figure 1.2. The East African Community (EAC) has made the most progress overall, largely due to its achievements in regional trade and the free movement of people. The Economic Community of West African States (ECOWAS) has similarly come far, but has made more progress in terms of financial and macroeconomic integration. For instance, eight of the 15 countries that make up ECOWAS have a common currency: the CFA franc. But how do every day African citizens feel about regional integration? Figure 1.1 shows the responses from a 2014/2015 Afrobarometer survey, which surveyed African citizens on their views on regional integration. 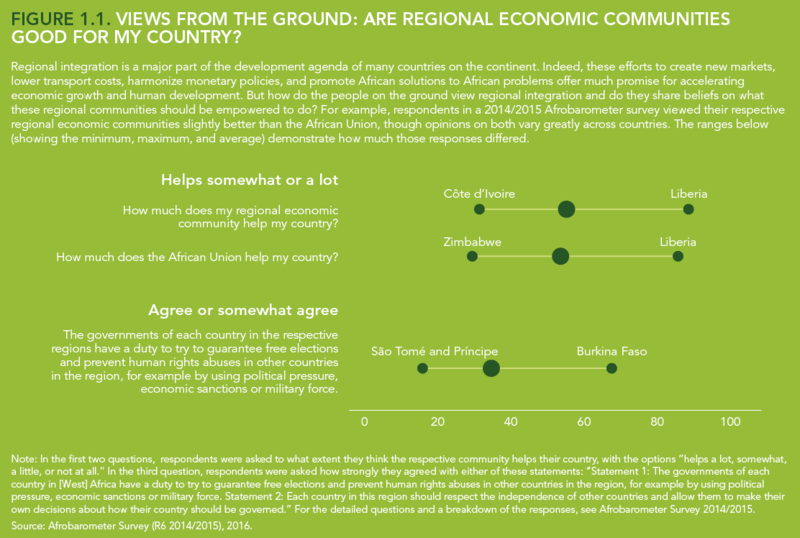 The results show that while more than half of the people surveyed believed that the African Union and their respective RECs were helpful to their countries, respondents viewed their respective regional economic communities slightly better than the African Union in terms of the ability to help their countries. The statistics below (showing the minimum, maximum, and average of opinions) demonstrate how much those responses differed. While respondents, on average, saw great value in their respective RECs, they still greatly value their sovereignty. Less than 40 percent of respondents agreed that REC members had a duty to guarantee free elections and prevent human rights abuses in other member countries of the REC. These answers also vary across sub-Saharan Africa. Views from the ground show that Africa’s regional economic communities are making noticeable progress toward integration. While some are further ahead than their counterparts, the road ahead for all is paved for increased regional integration.